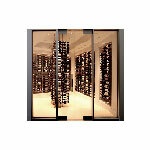 Do you love the VintageView Racks, but need to mount them in front of a wall made of glass, mirror, or uneven stone? These floor ceiling mount frames are your answer! These frames can be adjusted to suit your ceiling height, and allow you to mount your VintageView racks in applications where wall mounting is not an option. 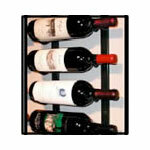 Ideal for restaurants & corporate environments where you want to showcase your wine. Also commonly used in home cellars where there is a lot of glass or stone in the cellar design. Ideal for installation adjacent to glass walls. These are the FRAMES to allow for Floor/Ceiling Mount. Standard Height is 10ft however these can be custom cut on site to fit ceiling height. Taller sizes available. Mount our single, double or triple deep VintageView racking on one or both side of the Floor Ceiling mounting frames. These are the RACKS to attach to the Floor/Ceiling Mount Frame. Various options for the Floor Ceiling Frames depending on how the racks will be installed. Racks installed on only one site, need backer bars. Taller than 10ft ceiling, use the coupler extension or mount directly to the wall. Angled walls, no problem.